Q. How do I access the full text of articles when searching PubMed? PubMed is the go-to resource in biomedicine and many other scientific disciplines. While many researchers are accustomed to searching PubMed, it may not be obvious how to access the full-text of articles that the library provides access to. The first step is to access PubMed through the Databases section of the library webpage. Although PubMed is free to search, accessing it through the library will ensure that you are provided an easy way to access the full text of articles from within the database itself. 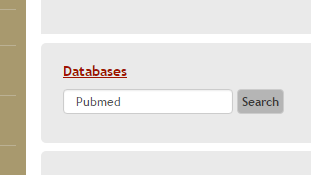 You can either search for PubMed in the database search box, or click the Databases link to find it alphabetically. Once you have gotten to PubMed using either the alphabetical database listing, you can search PubMed as normal. After selecting a particular article from the results list, you will see the library’s “Article Linker” button in the upper right corner of the screen. Clicking on this button will route you to the library’s copy of the article. If the library does not have an electronic copy of the article, you will be taken to a form to request the article through our document delivery system or through interlibrary loan.